Heritage award-winning restoration to breathtaking standards. This magnificent 1911 Romanesque style church boasts luxury accommodation. Suitable for couples, families and corporate use. 3 master suites, all with ensuites including king size beds dressed in Egyptian cotton bed linens. Limestone clad ensuite bathrooms and spa. The main church area has a fully equipped gourmet kitchen. Limestone flooring throughout with underfloor heating. The property is fully furnished with an eclectic mixture of antique furnishings and contemporary inclusions. Secure compound with covered parking. We operate a Twin Share booking process with the 3 Suites in the Church.
""""" When a couple and an additional guest are booking a total of 4 guests are required to be listed to generate the correct pricing. *** Two couples and a single guest are required to place the booking for 6 guests to generate the correct cost. NB. Suites not booked will be locked off. NOTE 'CHURCH COTTAGE' ( HAAU 9097315 ) next door is part of our property compound and offers additional accommodation for 4 People. POA for groups of 10 or more. NB. Decor inclusions may vary from depicted photographic material from time to time. 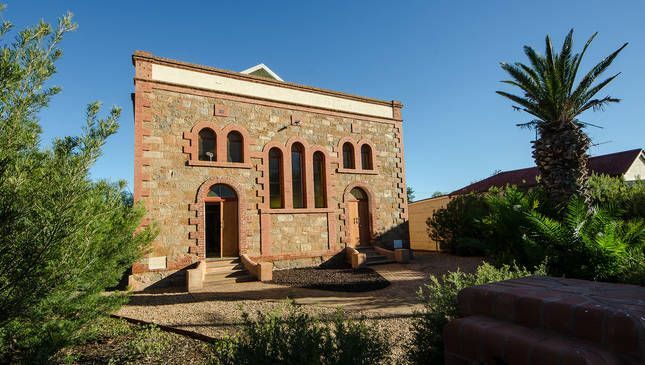 This is a unique property in any location but to find it in suburban Broken Hill was a revelation. We occupied the ground floor space which comprised a massive living/dining area, very well appointed kitchen, master bedroom and ensuite which included a large spa. The renovation is beautifully handled with high end finishes and appliances. We enjoyed self catering here using the nearby Coles supermarket for supplies. Two suggestions (which I hope are regarded as constructive are, first, the property would benefit from a barbeque and an outdoor eating area. Secondly, I have a problem with properties which don't offer free Wi-Fi. Having stayed at a large number of similar properties in Australia and internationally, only a very small percentage don't supply free Wi-Fi. I understand it is possible to use a mobile phone as a modem but that is not the point. Where mobile coverage is spasmodic (as it was here) the preferred Wi-Fi service provider can be accessed by the property owner and ready, uninterrupted service provided to guests. Notwithstanding this issue however I would highly recommend this property to others. Outback Church provides unique holiday accommodation. Two of us enjoyed the spacious opulence of the lower level. Everything was first class, with a degree of comfort that matched the luxury. Fixtures, fittings, crockery, cutlery, linen, robes all reached a superb standard. Luxuriated in this accommodation and loved it. Congratulations to the owners and caretaker, Billy, for providing exceptional service. Unbelievable place; pictures don't come close to capturing it's uniqueness. Palatial spaces with historic touches. Reminiscent of old English abbeys; yet in the real outback! Certainly pricey but well worth it for that special occasion to spoil yourself, (especially compared to what you'd pay in the big smoke). Do it once! I would not recommend this accommodation to anyone going to broken hill. The only plus was the lovely groundskeeper Billy. We at Outback Church Stay have gone to great lengths to meet or exceed the expectations of our guests. As a team we can only apologise when expectations are not met despite best efforts.